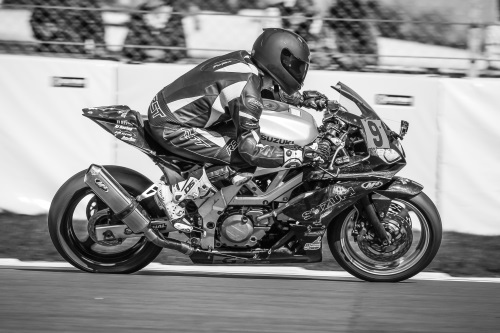 Last weekend I went to Donington Park with Bemsee to ride the GP circuit. It absolutely poured down on Friday night and then froze in the early morning. I woke up to a frost on the van and a very wet track. Thunderbike Sport (TBS) qualifying was up first at 9am so I ventured out with wet race tyres on front and rear and tip toed around not wanting to crash as this was going to be a busy weekend and the last thing I fancied was bending the bike. I set a fastest time of 2:21.773 which gave me a start position of 23rd. Next up was the Minitwin (MT) qualifying, the track was slightly dryer so I opted to put a dry rear tyre in and leave the wet front. I set a fastest time in the MT’s of 2:00.747 giving me a start position of 31st. Saturday was very busy with lots of incident which meant the club had to take the unprecedented move of cancelling all of the second races of the day as there just wasn’t time to fit them in. So in the first TBS race I finished in 23rd with a fastest time of 1:54.482 and in the MT race I finished in 30th. Sunday I awoke to blazing sunshine. In the TBS race 2 I finished in 17th and in race 3 I got up to 16th. I was one place short of the points. In the MT race 2 I finished in 22nd and in race 3 I finished in 21st. As the weekend went on and I spent more time on the bike I got more and more confident and faster and faster. I still need to be more aggressive off the start as I lose a number of positions to corner 1 but I did set a new PB for myself at Donington Park, a 1:50.225. Next up is Silverstone on the 30th April.